* Set up for the BIG PARTY! (Balloon bounce and games). 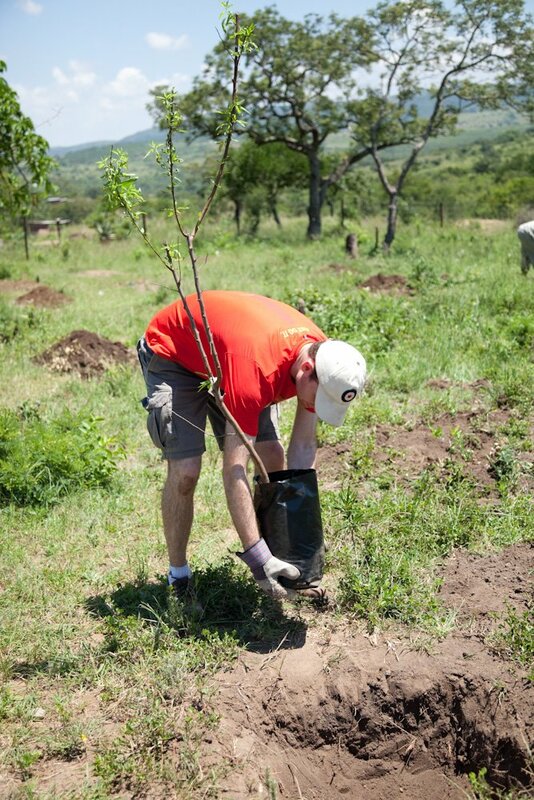 * We planted 21 trees today. Pecan. Mango. Orange and a few others. 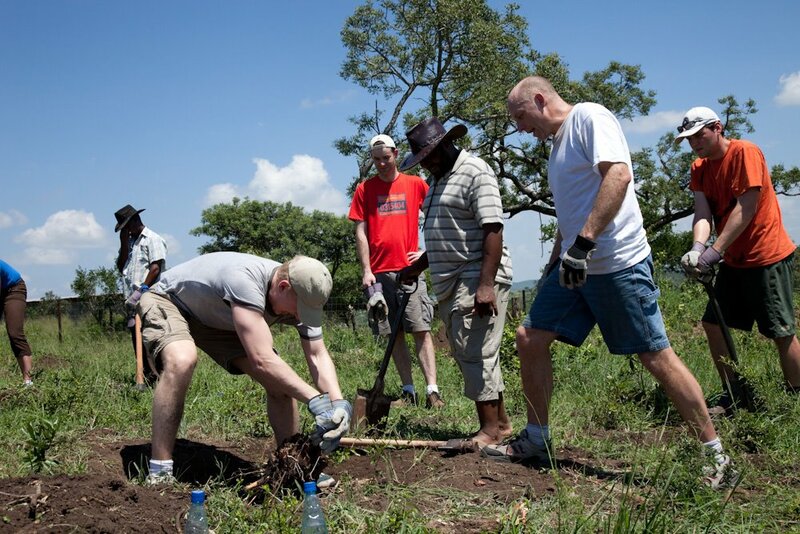 * We helped finish the walls on the latrine. Roof goes on Monday. * The roof of the church was painted with that space-age paint. We’ll see tomorrow how much cooler it makes the building. * The tractor arrived (too bad the driver had been into the marillo drink!) He almost took out about 6 of our freshly planted trees…but we managed to get the garden plowed. Monday we clean it up, hoe and plant! * The solar panel was mounted for the solar pump. * We had a ‘block party’ like lunch. 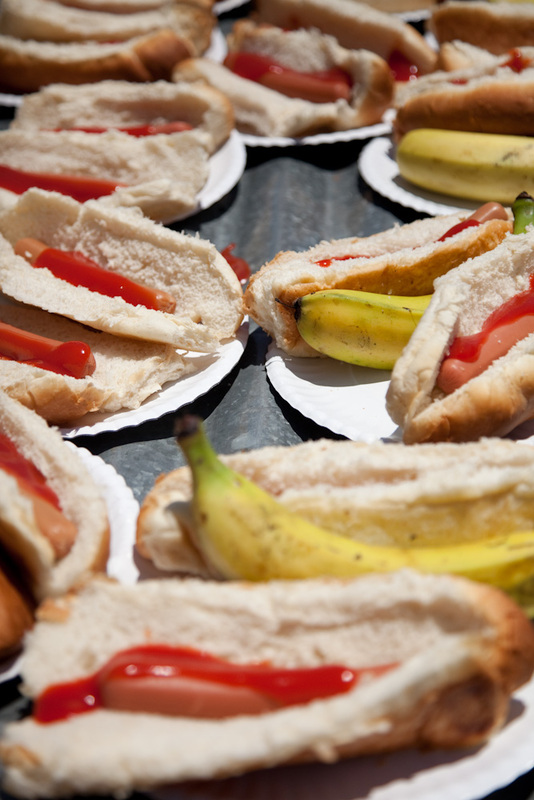 Each of the 100 kids got two hot dogs, a banana and juice. It was the first time many of them had had a hot dog. (Many had no clue how to eat it). * After lunch, we were treated to a powerful play (put on by the kids) of Daniel and the lion’s den. * Next, they sang an absolutely amazing song that Precious had written about HIV/AIDS, where it came from and how to conquer it! WOW! We got it on video. * Then we started the CarePackage and candy bag distribution. What a hoot! We got pictures of all the kids that got packages. * After the kids left, we brought Elliot our bus driver in and game him a gift. Next we invited Pastor Peter, Precious and their kids in. 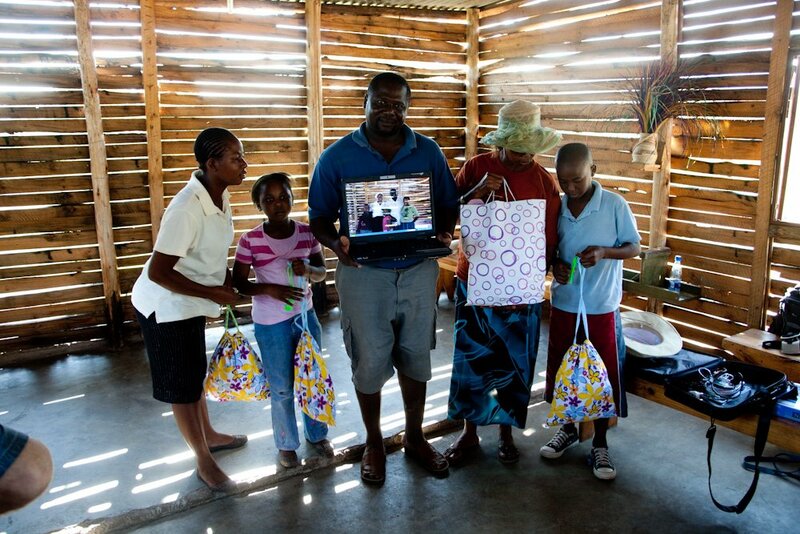 The three kids (8/12/14) sang two amazing songs for our group…then we gave all of them special gifts. The kids got Canada sweatshirts from the Forks. Precious got a book, a SwaziTeam 09 t-shirt and a beautiful bag full of beauty-stuff. Then we gave Pastor Peter a study Bible, a SwaziTeam 09 t-shirt and a power converter. He was a grateful for the power converter…but a little confused. Finally, Todd told him he would need that adapter for …his new laptop. His wife screamed and thanked Jesus…his kids were absolutely charged …and Peter was blown away! * Once we had cleaned up the care point … we headed back to our compound for an evening dinner, some down time, a bunch of Skype calls home…and now we are practicing a song for church tomorrow. * Back and Jumbo and Kriek’s place…we blessed them with a few special gifts as well. Church…you need to know that Riverwood has become legendary here for its generosity! The missionaries can’t believe what our little church has given away! 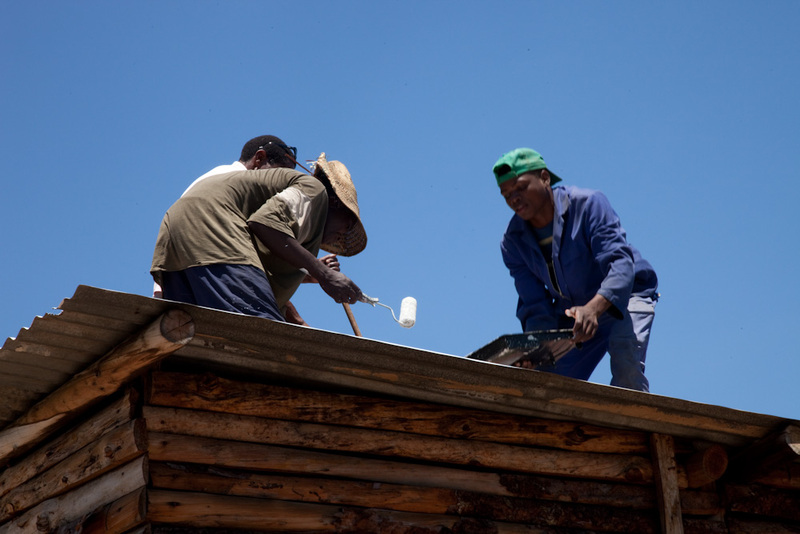 The CarePoint…the D-team…the pastor and people of Enaleni…they have told us how the Lord has used YOUR generosity to feed the hungry…build an effective CarePoint in Swaziland…grow God’s church…and bring people to Christ. They are so incredibly grateful and call Riverwood Church a gift from God! It is so hard to put into words all the varied emotions I have experienced on this trip. At times, it feels so surreal. As I look up at the stars and realize that I am in Africa – serving an awesome God. Each day my love for these amazing people grows. On Friday, I had an amazing privilege, along with Scott, Karen, and Mitch, to make a home visit. We were able to visit the family of the little girl that Mitch and I sponsor. We were so warmly welcomed. The mom was thrilled to meet us. She recognized us from the photos they had received. After our visit, we asked permission to take a photo with her family and our team. I was so touched when she went and CHANGED HER CLOTHES to have her picture taken with us!! It was the perfect ending to an already emotionally full day. As I tickled the bottom of a little girl’s foot, I was shocked by how tough her skin was…it was like leather! These children have become so precious to me, with their ripped clothes, no shoes, and sores on their legs. I am just so blessed to be able to love these kids. I am having a blast making music with them. They love my “talking drum”, but I’m not sure who has more fun: them or me! An boy! Can they dance! Today was a busy, fun-filled day that topped up our sometimes tired, heat-laden souls! In addition to many milestone construction moments, we were blessed to share the gifts our church prepared for Pastor Langa and his family, as well as our gracious hosts, Jumbo and Kriek. Many of us were brought to tears at their shouts and jumps of joy; at the thought that our church family could provide such a blessing to our partners halfway around the world. But the best part was peeking through the window as Pastor Langa took the laptop outside to show some church members and the D-Team. Within seconds, he was lost from view, the centre of a tight circle of 15 people. But I could still hear his trademark laugh amidst all the shouts and cries of excitement. Thanks to everyone at home who supported us and prayed for us. You lift us up and blessed us in sharing this special moment. I wish you all could have been here! 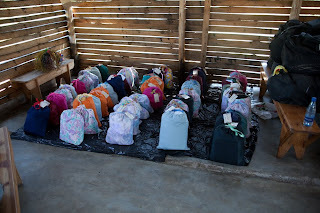 It never ceases to amaze me the amount of blessings that are pouring through this care point. We came to Swaziland ready to serve and bless these children and, time and time again, we are the ones who are showered with blessings. Today, as I took photographs of the children when they were handed their care packages, I was nearly overcome with emotion. It’s hard to put into words the impact an act of servanthood can have. 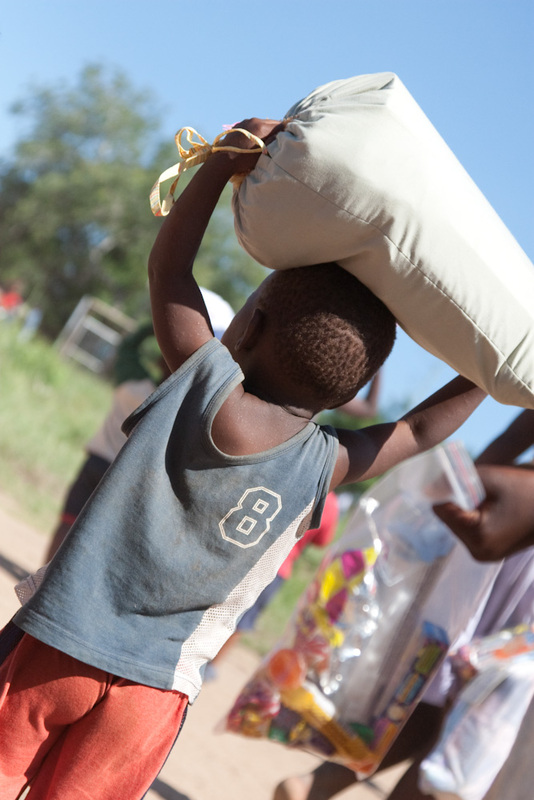 Some of the children accepted their bags quietly, while others’ eyes lit up at the sight of the beautiful bag being handed to them. I think that what affected me most was the sounds of the children cheering as their friends’ names were called to go and accept their gift. What a moment! We are truly blessed to have these children in our lives. Stay tuned as tomorrow we go to church at Enaleni (Todd is preaching and we’ll be singing and sharing a few testimonies). After church, we’ll be enjoying KFC with the church (maybe 150 people) before heading off to the market. Hopefully we’ll even squeeze in some down time. Day 3…and WHAT A DAY! Wow Team! What an incredible last couple of days. God is doing amazing things through each of you!It is so obvious that your love, hugs, generosity and hard work are expressions to our friends there of God’s love. 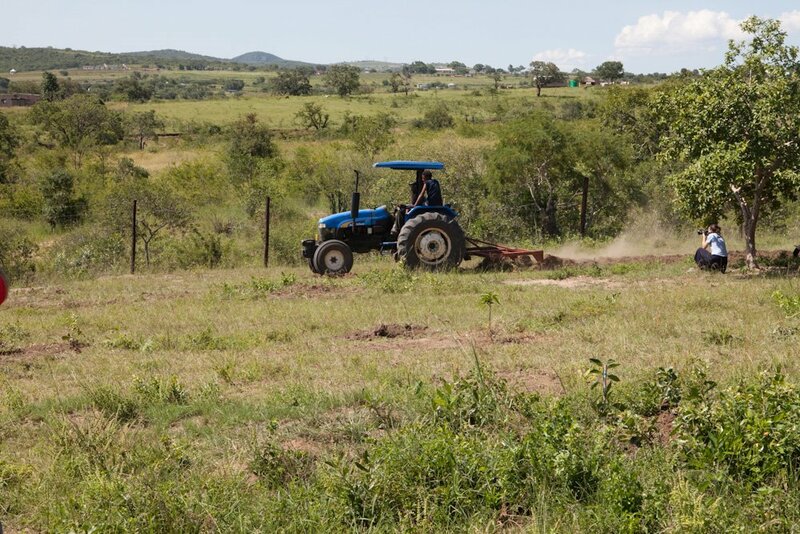 It is so exciting to see our Enaleni and “the hope of a harvest” becoming a reality. I’m praying for strength and refreshing for you as you rest tonight. Have an awesome day at church tomorrow. You will love it!Love and prayer for you all! I am speechless. As we sit here it the comfort of all our luxuries I reflect on what these people dont have. I just explained and showed my kids day 4. It is hard not to be emotional to think that these kids are having hot dogs for the first time.I can only imagine how difficult it will be to say good bye. I wish all of you the best in saying your goodbyes to all the friends you have made.It gives all of us something to reflect on in the future. “Love is patient…kind…not jealous…does not brag…is not arrogant, does not act unbecomingly…does not seek its own, is not provoked, does not take into account a wrong suffered, does not rejoice in unrighteousness, but rejoices with the truth; bears all things, believes all things, hopes all things, endures all things” (1Co 13:4-7). I was reading today that love is difficult to define, but it can be described by the behaviour it produces. My devotional says, “Paul painted a portrait of the kind of love Jesus wants to produce in every believer. It is, in fact, a portrait of Christ Himself, who is love’s highest expression.” I was thinking about the tremendous impact you are all having on everyone over there as well as over here. 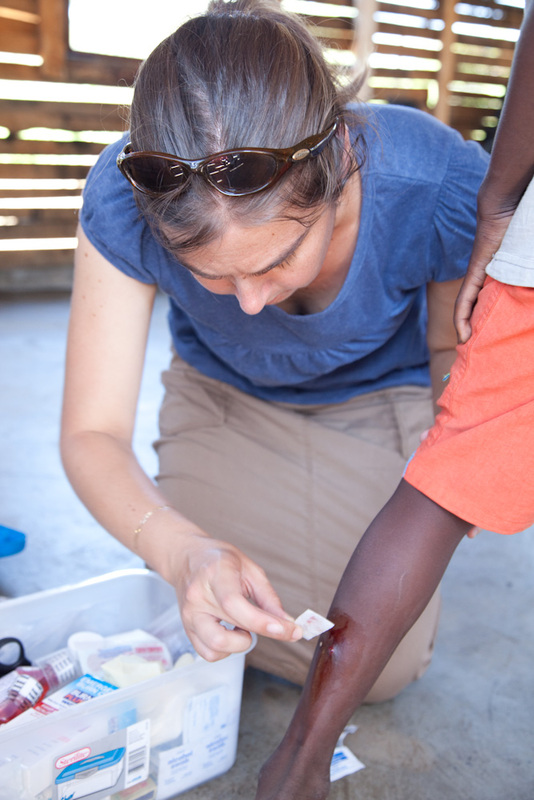 I think it is because you’re on the ground doing what Christ would do, loving people with actions… not just words… not just gifts… not just money… but as one picture shows, carefully cleaning the sore on a child’s leg and people knowing you want to do this. This is the love Paul wanted us to understand, know, and portray. Have an awesome day worshipping our great God with the people of Enaleni. I can’t believe it is only “four sleeps” until I have my beloved back with me. You are all such an encouragement to me! I get shivers when I read about what you're doing and the EFFECT it's having on the people of Enaleni but especially on the team!! Having done short term missions before I KNOW your lives have been changed forever. And for the better!!! I'm praying for safety and good health for you all and for God's love to continue to work in the lives of those you touch and in you. Tanya & Ken – Love you guys and am looking forward to hearing details when you get home. Blessings to all of you out there…. praying that God will refresh you with hope and ease the sorrow/ culture shock as you emerge into johanseburg and the air trip…. and you still have? bobokazi to visit? WOW! it was really enat to hear jon sharinng of the skype call he had with you guys at the 11am service… looking forward to the video of the kids drama…… get a good rest, and practice your teaching of how to properly dance…. carry the joy of the children and staff with you as you enar the end of your journey…. may God enable you to remain viligent in wearing your HATS/ drinking lots of water, and most of all…. laughing, getting swazi dust into your hair, and being jungle gyms for the kids… Jer 33:3 for the staff out there and also psalm 139 – they are infinitly designed by the FATHER…. tell them thanks for blessing us all out here at home and allowing us into thier couragous journey…. Wow! What a incredible time you all are having! I know the kids must have loved opening their gift packages. I wish I could have been there to see the smiles on their faces! 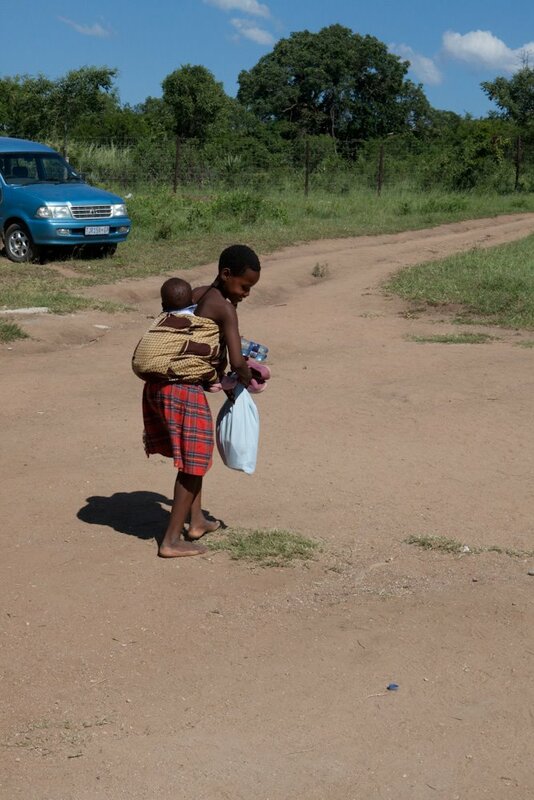 Thank you all for the sacrifices you all made to go to Swaziland. The Lord will return to you blessings for the labour you have put forward. Not that you asked for any, but just that God is a good giver of blessings! We continue to pray for you and have a safe journey.